Justin Houston was already revered as one of the top pass rushers in the NFL. Now, after the Kansas City Chiefs’ 29-20 victory over the Washington Redskins on Monday Night Football, the four-time pro bowl linebacker also holds a special place with football bettors. With Kansas City up 23-20 following a go-ahead field goal with just four seconds remaining in the game, the Redskins snapped the ball on their own 25-yard line in a last-ditch effort to pull out a miracle. After a pair of cross-field laterals, the ball was knocked loose and scooped up by Houston who, instead of just falling to the ground to end the game, stiff armed his way into the end zone to put Kansas City up 29-20 as time expired. The Chiefs then took a knee on the extra point and gave KC bettors the win of their life and dealt Washington backers one of the worst beats in NFL betting history. “This might be meaningful to some,” chimed in ESPN play-by-play announcer Sean McDonough after Houston trotted over the goal line. That’s a bit of an understatement. NFL bettors weren’t the only ones blown away by this series of events. Sportsbooks who take football bets online were also slack jawed as Houston scored what the mainstream would dubbed a “meaningless” touchdown. In the sports betting world, however, that “meaningless” score caused a half million-dollar swing for some sportsbook operators in Las Vegas and offshore. 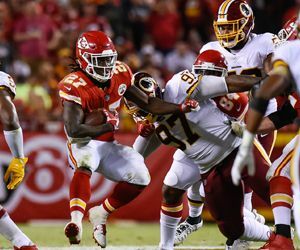 The undefeated Chiefs were the popular public pick as touchdown favorites for the final game of Week 4 and like most primetime contests, the betting public was also backing the Over on the total, which closed as low as 47.5 points. Houston’s touchdown covered for KC and pushed the final score Over the number. Johnson mentions the teaser liability (an alternative wager in which the bettors can slim six points off the pointspread by tying two or more games together) but there was also plenty of regular parlay liability rolling into the Monday game. Any high-return parlay bets that survived Sunday were hinging on Monday’s result, and the betting consensus was handed a gift by the Chiefs defense. “At least for the bettors,” he chuckles. SportsBettingOnline.ag is one of the most respected online sportsbooks in the industry, offering wagering on the NFL and all major sporting events. Check out SportsBettingOnline.ag for the latest NFL betting odds.